Peter Johnstone, a member of the J/Boat family dynasty and a highly accomplished racing sailor, founded Gunboat 15 years ago by building a 62-foot catamaran for bluewater cruising with his children. Named Tribe, the boat performed brilliantly, logging 300-mile days consistently and occasionally flirting with 400. Johnstone’s notion of a paradigm shift in performance cruising had been duly bench tested and when he returned after a year and half of voyaging he began developing the Gunboat concept in earnest. Gunboat has built cats as large as 90 feet and as small as 40 feet. Today the company builds three models in its new facility in Wanchese, on Roanoke Island in the Outer Banks of North Carolina. It’s nice to see Gunboat has relocated production to the United States, where it employs about 100 people, after originally building boats in South Africa. 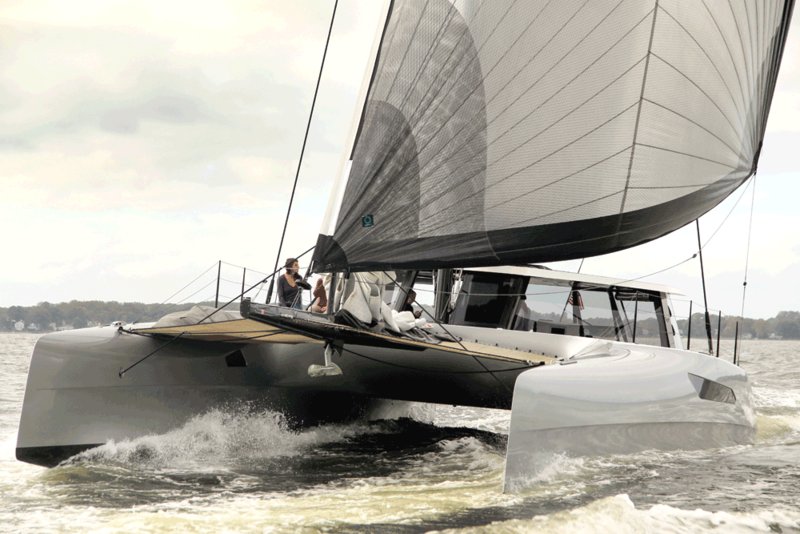 The Gunboat 55 is the logical evolution of other Gunboat designs, and it follows closely in the conceptual footsteps of the 60 that was introduced in 2013. Gunboat is at the epicenter of composite construction and relentlessly pursues technology that fosters building extremely light yet incredibly strong boats. or sprit. Even the interior furnishings and structural floors are Divinycell and carbon composite panels. The 55 has hydraulically controlled retractable centerboards that can be raised manually if necessary. The rudders retract manually. Board-up draft is just 2 feet. The boat has a natural positive buoyancy and watertight bulkheads are used to seal off bow and stern compartments in the event of a collision. The mast is carbon fiber, a finely finished T600 modulus made by Hall Spars. The boom, masthead and spreaders are also carbon fiber. The box section boom has spreader bars to host widely placed lazy jacks and features a 1-to-2 reverse ratio, hydraulic-ram-controlled mainsheet that can be dumped quickly if necessary. The standing rigging consists of torsional aramid fiber luff cables and cap shrouds with carbon diamond stays. When I stepped onto the foredeck I was impressed by how quiet the rig was. Blasting along at 15 knots it was almost eerily silent on deck, no moaning or grinding, just the soft swoosh of water racing by and through the hulls. All running rigging is Spectra or Dyneema, super low-stretch and stripped race-boat style with lashings on the ends for handling.